Grandsons John and Andrew play with the suspended magnets ‘science toy’ their dad made from wood scraps and magnets purchased at a local Radio Shack®. As the boys play with their toys, the toys have a subtle but important role in fueling and sustaining their curiosity about the natural world they play and live in. 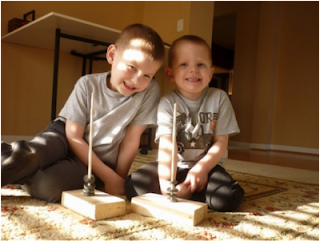 As youngsters build their conceptual models of the physical world, they encounter two types of forces; contact forces and forces that act at a distance. Contact forces are easy for them to understand—they feel the handle of the wagon as they pull it along and they feel the force acting against them as they push on a box to move it. Force, defined as a push or pull on an object, is learned through play long before it’s taught in school. But the push or pull may not always be visible and result from directly contacting an object. Forces like gravity and magnetism, forces that act at a distance, across space, have a mysterious, ghostly quality to them. 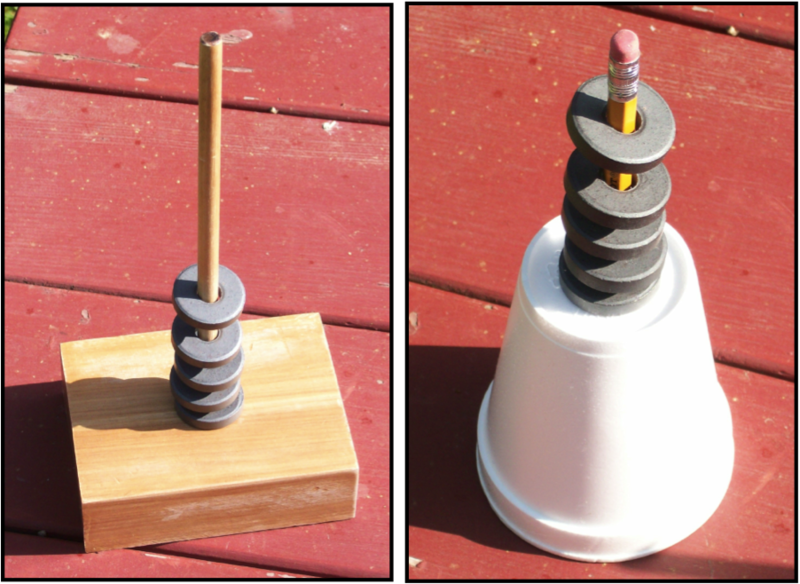 This toy is a great tool for kids to experience the forces of gravity and magnetism in a playful way. Magnets – go to your local Radio Shack® and ask the clerk for Catalog #: 64-1888, a package of five circular magnets with holes in the center. It will cost you three bucks. 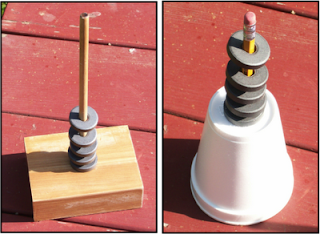 To make a magnet stand you can simply push a pencil through the bottom of a Styrofoam cup or, for a more permanent toy, drill a hole in a block of wood and glue a dowel in the hole. It’s that simple. Watch the kids as they play with the toy. You’ll see them experiment with both the attractive and repulsive magnetic forces as these forces also interact with the force of gravity. There’s a lot of science in this simple toy. In earlier posts (see Do You Believe in Ghosts? (April 2009) and More Evidence that Ghosts Exists (June 2009)) I defined “ghosts” as unseen entities; that can exert an influence on objects in the physical world. A magnet can exert a force on another magnet or certain metals and a large mass, like the earth, can exert a force on a smaller mass, like you. In a later post I will discuss ‘field forces’ (of which magnetism and gravity are examples) and how field forces differ from contact forces.